There are some cities in Europe which have significant hockey history. Many of these cities have seen several championships over the years and have had many players succeed in professional leagues around the world, including the top European leagues and, most notably, the NHL. Tampere is one of those cities. One of the largest cities in Finland, along with Helsinki and Espoo, Tampere has been a celebrated centre of the game over the last eight decades. The older of the two teams, Ilves Tampere, has won 16 SM-liiga and SM-sarja championships since 1936, the most recent coming in 1985. The younger team, Tappara Tampere, has accumulated 12 titles since 1959, the most recent in 2003. Additionally, the Finnish ice hockey museum is in Tampere, and the Tampereen jäähalli (“Hakametsä”) is the first hockey arena ever built in the country. Several former NHL players have called Tampere home, including Teppo Numminen, Raimo Helminen, Jyrki Lumme, Vesa Toskala, Ville Nieminen and Janne Ojanen. Flemingsbergs IK J20 goaltender Niklas Nordlund is another player who calls Tampere home, trying to also make a name for himself in hockey. Born on February 28, 1993, Nordlund started playing hockey at the age of seven. He played both as a forward and as a goaltender but, after a while, he decided to play full-time as a goalie. Over the next seven years, Nordlund prepared himself for the higher levels of junior hockey in his hometown. By the age of 14, he was playing in the system of Ilves Tampere en route to their under-16 team. He was even brought to Canada in 2008 to play three games against bantam hockey teams from Ontario and Quebec. Nordlund played against the Whitby Jr. Wildcats, the Oshawa Jr. Generals and a team based out of Montreal, his first exposure to North American hockey. That same year, Nordlund joined Ilves’ under-16 team in the Jr. C SM-sarja. In his first season, he found himself to be the #1 goalie. He played considerably well, recording considerable statistics. In sixteen regular season games, he had a 3.19 goals-against average and a .908% save percentage, quite decent for a 15-year-old netminder. Nordlund also played in four qualification games to prevent his team from being relegated; he responded by registering a 3.25 goals-against average and a .909% save percentage, helping his team avoid relegation. Among his teammates that season was Jesper Kokkonen, the son of former LeKi head coach Vesa Kokkonen; the younger Kokkonen has appeared in one game with Ilves in the SM-liiga and will play for them in 2012-13. He also played with Tomi Wilenius, who recorded a goal and and an assist in six games in the SM-liiga as an 18-year-old in 2011. Nordlund also periodically played against Ville Järveläinen who, after being named the Jr. A SM-liiga’s top rookie in 2011, joined the USHL’s Green Bay Gamblers in 2011-12 and has since committed to play for St. Cloud State University. Nordlund graduated from the Jr. C SM-sarja in 2009 and, at the beginning of the next season, he found himself alternating between Ilves’ under-17 and under-18 teams. The under-18 team played in the Jr. B SM-sarja while the under-17 team played in the Jr. B2 SM-sarja, a tier just below. Upon his arrival to the under-18 team, Nordlund was in a rotation of goaltenders that also included Colorado Avalanche draft pick Sami Aittokallio; it also included other veteran junior goalies such as Santeri Leppänen and Roope Antila, as well as a young up-and-coming netminder named Jerry Kaukinen. When Aittokallio was called up to Ilves’ under-20 team, Nordlund was allowed to play in two games with the under-18 team, registering a 5.67 goals-against average and a .789% save percentage, and he also played in one qualification match. 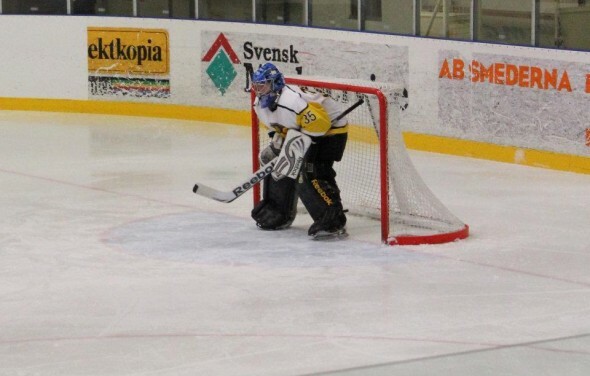 Nordlund was also in a goaltender shuffle with Ilves’ under-17 team, especially with Antila and another 1993-born goaltender, Mathias Biskop, securing the top two positions. (Biskop has since graduated to a 21-game rookie season with Ånge IK in the Swedish Division 1 League.) He did, however, get to play three games, registering a 5.77 goals-against average and an .866% save percentage. Even though he did not get to play in the postseason with Ilves U17, he was able to receive a silver medal that every member of the team won that year. That being said, however, the 6′, 165-pound goalie did also find himself in elite company the next season, as well. He transferred out of the Ilves system to that of LeKi, a team in nearby Lempäälä, which is south of Tampere. The main affiliate of Tappara, LeKi had employed players such as Pasi Petriläinen, Niclas Lucenius, Ossipekka Lehtonen and Joonas Rask in the past. On the under-18 team, which played in the Jr. B II-divisioona league, Nordlund shared the crease with three other goalies that season. He split the games with two 1993-born netminders, Leo Koskinen and Joonas Helenius, and with one 1992-born goaltender, Akseli Lintulaakso. Nordlund recorded a 4.05 goals-against average and an .888% save percentage in four games during the regular season. He also played most of the games during LeKi U18’s qualification playoffs in hopes of possible promotion to the Jr. B I-divisioona for 2011-12. Despite him recording a 4.18 goals-against average and an .894% save percentage in six games, his team was not promoted. Nordlund did get some professional grooming during the 2010-11 season. After his season with the under-18s ended, the top team assigned him to their second-tier squad, who play in Finland’s fourth-highest league. On a team who had employed eight goalies throughout that season, they did find some promise in Nordlund. He played five games, registering a 5.54 goals-against average and an .885% save percentage. If that was not impressive enough, Nordlund was also given the chance to practice with some seasoned professionals from his homeland, some who had enjoyed careers longer than the young goalie’s life. Among these included Jyrki Jokipakka, a defenceman who was chosen 195th overall by the Dallas Stars in the 2011 NHL Entry Draft; Juha-Petteri Purolinna, a blueliner who has appeared in ten SM-liiga games and has been in the Mestis regularly since 2008; Arto Tukio, a 2000 fourth-round pick of the New York Islanders with experience in both the SM-liiga and the Elitserien; and Jussi Tarvainen, a 1995 fourth-round pick of the Edmonton Oilers who has played in the SM-liiga, the Elitserien, the Nationalliga A in Switzerland, the 1. Národní Hokejová Liga in the Czech Republic, and both the Erste Bank Eishockeyliga and Österreichische Eishockey-Nationalliga in Austria. During the summer of 2011, Nordlund practiced again with LeKi’s Mestis team. He also got to appear in some preseason games with KOO-VEE, a team in the Suomi-sarja (Finland’s third-highest hockey league) which also plays in his hometown of Tampere. After going unsigned by any teams for the first part of 2011, Nordlund was finally given another chance to play, this time in Sweden; on December 4, 2011, he transferred to Flemingsbergs IK’s under-20 team who had been promoted to the J20 Elitserien for the 2011-12 season. After Fredrik Rådbjer opted not to play in 2011-12, and Andreas Nilsson graduated to play for Segeltorps IF in the Swedish Division 4 League, Nordlund was brought in to be the third goalie for a team that already had Daniel Öndemar and Jonathan Gunnarsson. He did well in his eight-game stint, recording a 3.68 goals-against average and an even .900% save percentage. Nordlund was also called up to be the backup for the men’s team, who play in the fourth-highest league in Sweden, for four games, two in which he appeared; they did not have a permanent backup for their #1 netminder, Philip Bjur, so they used Nordlund and Öndemar. They also allowed underage goalies Mikael Lafferentz and Tobias Karlsson to practice with them, as well as giving tryouts to Robin Syrman and Mattias Blomgren-Sköld. With the season almost over for Flemingsbergs IK J20, it begs the question what will be next for the young Finnish goaltender. With Jonathan Gunnarsson graduating in 2012, he could return to Flemingsbergs or even to a team in Finland. If one were to ask Nordlund where he would prefer, though, he would likely say North America. No matter where Niklas Nordlund goes, he will be surrounded by great players but all he needs now is a great opportunity.